NOSE: A pilsner aroma with an impressive amount of hops. It’s grassy and earthy with a touch of caramel and a very floral hop profile. TASTE: The herbal hop profile gives the beer a faint bitterness throughout the sip, but it’s mostly a bready, biscuity malt backbone. The alcohol is present in the crisp, dry finish. MOUTHFEEL: Medium-mouthfeel and good carbonation. Just a bit syrupy. DRINKABILITY: Pilsners certainly aren’t my beers of choice, but Terrapin does the style proud. Considering that this is theoretically the same style as a Bud, Miller, or Coors is just amazing. The big hop profile adds a ton to the brew, but the delicate Pilsner taste and aroma manages to hold its own. I don’t think Pilsners are ever going to win me over, but for the style, this is about as good as it gets. 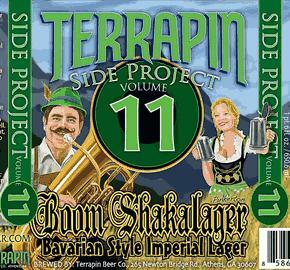 Posted in Tasting Notes.Tagged Bavarian Lager, Boom Shakalager, Imperial Pilsner, Terrapin. Thanks for sending one of these up my way, Brother Barley. While the beer certainly didn’t blow me away, when you consider the style and what they had to work with it was remarkably tasty. I finally cracked the bomber Brother Barley kindly sent me last night, and I was pleasantly surprised. I’m really not a pilsner guy, and I was skeptical that you could pump the style up this high without it being an undrinkable mess of a beer. But I found myself actually paying attention to what was going on with this one (note: that’s how I broadly divide beers in my mind. If I want to pay attention to a beer’s subtleties, it’s “good”. If I have to try not to pay attention, it’s “not so good”. The line lies at roughly 2.25 hops on the Aleheads scale.). Certainly another interesting side project from Terrapin. Previous Post WORLD CLASS IMPERIAL STOUT……FROM CANADA?